Oi, I'm a bit lost, my children. Can someone answer....? Oookay, this is a bit complicated. It is also not 100% confirmed yet, just like, 98% confirmed. Holy Rome DID die during the war, and France was the one who dealt the finishing blow. However, the Holy Roman Empire was in control of a lot of countries, such as Prussia and all his brothers (Saxony, Hesse, Bavaria, etc) and now that he was dead, they were floating apart because of how different they were. 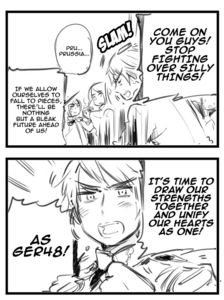 Prussia, being concerned over how much his siblings were fighting, and noticing how countries around them were getting stronger and stronger, decided that enough was enough. If any of the surrounding countries decided to attack them the way they were, they wouldn't stand a chance. So he united all his siblings, and - with the body of the Holy Roman Empire - gave life to Germany. To sum it up; HRE dies, and Prussia and his siblings uses the body to get Germany.